The first proper snowfall of the year in Scotland has given the crews taking part in this year’s historic rally run to Monte Carlo, an early taste of what lies ahead of them. Big crowds are expected to turn out tomorrow night in Clydebank in West Dunbartonshire for the UK start of the classic rally, the only British start point of six European cities for a range of classic cars to make the 1500-mile trip to the South of France which is staged by the Automobile Club de Monaco (ACM). Around 80 cars are expected to leave the start ramp in Aurora Avenue in the shadow of the town’s giant Titan Crane at 6pm on Wednesday January 30th in three separate categories. Among the cars taking part in that class will be three from the 1960s – a Mk2 3.8 litre Jaguar, a Rover 2000 SC, and an Austin A40, although the crew of that car had an early setback when their entire set of wheels and snow tyres were stolen from their garage over the weekend. They’ve managed to source a replacement set just in time. There will also be an Opel Kadett GTE, Fiat 124 Coupe, and Lancia Fulvia 1600 HF from the 70s. Several crews reported mechanical issues which would have to be resolved before they reach tomorrow’s start line. Other cars include a 1958 Standard Pennant, a French-entered Austin Healey Sprite from 1959 and a 65 year old Ford Popular. Once again the event will feature the popular Monte Heritage Runs which will follow on from the full-scale starts and take in a series of short classic routes in Scotland including Aberdeen, Stirling and Dumfries. A hardy group of ten crews have already set off from John O’Groats heading to Clydebank to join in tomorrow’s fun. Wishing the crews well today at Bowling Harbour on the banks of the River Clyde was the Convener of the Cultural Committee at West Dunbartonshire Council, Bailie Denis Agnew who said: “I’ve always felt that hosting the Monte Carlo Rallye projects West Dunbartonshire onto a world platform and the fact that drivers are travelling from America and France to start the Rally in Clydebank is testament to this. We are very much looking forward to welcoming organisers back to Clydebank as well as participants and spectators from near and far. 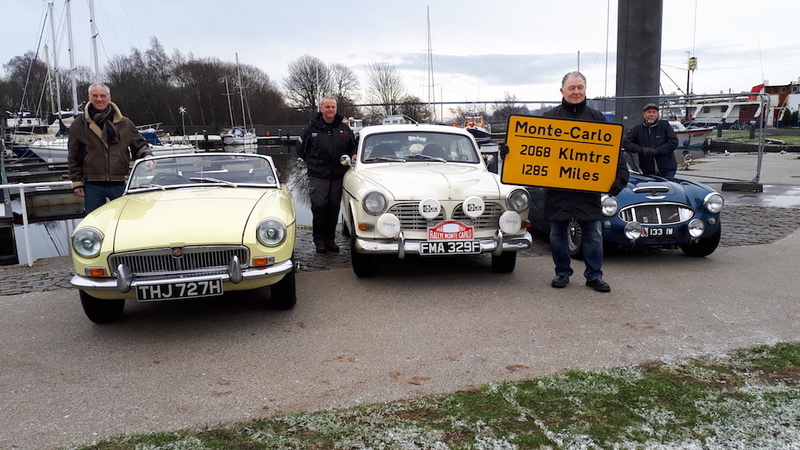 Douglas Anderson, the UK co-ordinator of the event and the man responsible for bringing the Monte start back to Scotland a few years ago, is delighted: “It is wonderful to have the Scottish start returning to Clydeside. The event grows in stature every year and we’re confident the 2019 event will attract big crowds to wave them off on their drive to the sunshine in the South of France. They’ll all be sharing the magic of the Monte”.